The holidays tend be a busy time, even more so and quite happily if you’re an artist that is creating a gift for someone to give. Here are a few of my most recent commissions. Some of these animals have passed on, others are alive and well — regardless, it’s an honor to be able to celebrate the joy these animals give to their owners. This coming weekend, July 14th and 15th--for the first time--I will be a the WedgWood Art Festival in Seattle with Artists Outside The Box. I'm excited to be a part of this new-to-me-festival. I'll be there all day Sunday and I encourage you to stop by and see the work of all of the artists. 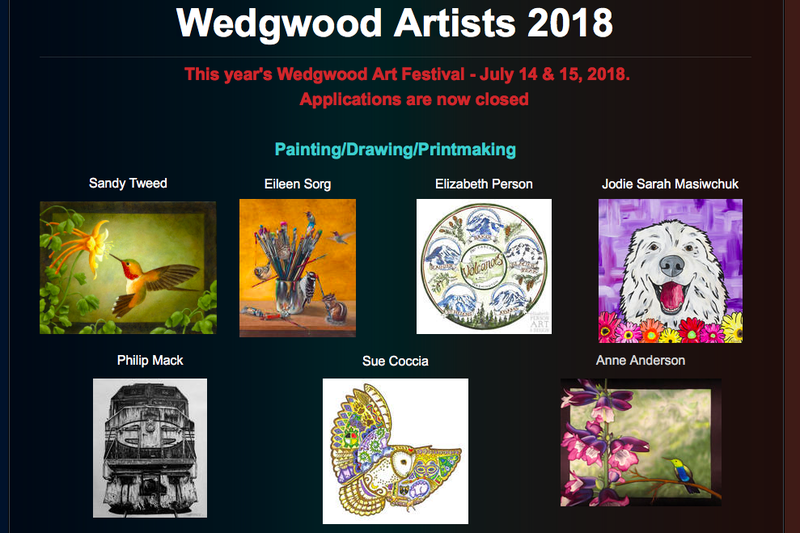 A few of the artists that will be at the Wedgewood Art Festival. The Wedgewood Art Festival is held at Our Lady of The Lake Parish School, corner of 35th Ave NE & NE 89th St Seattle, WA 98115. July 14th and 15th from 10 a.m. - 5 p.m. I hope to see you! I'm excited to share my work in this area of Seattle. 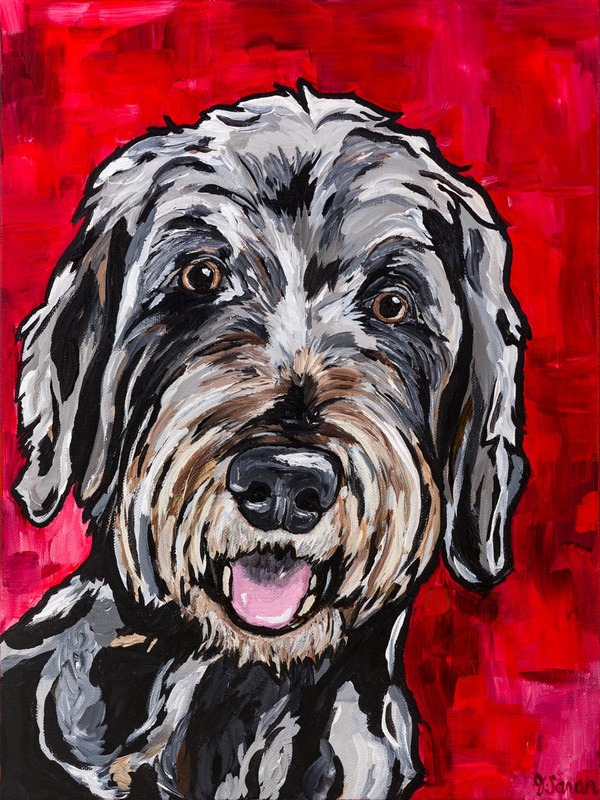 A couple of years ago, I decided to create paintings of dogs at Homeward Pet, a no-kill animal shelter in Woodinville, WA, that have been at the shelter a long time. This was in hopes to to help bring awareness to their situation and hopefully get them adopted sooner. Cooper was known at the shelter for being there a very long time...a year. He had multiple surgeries. 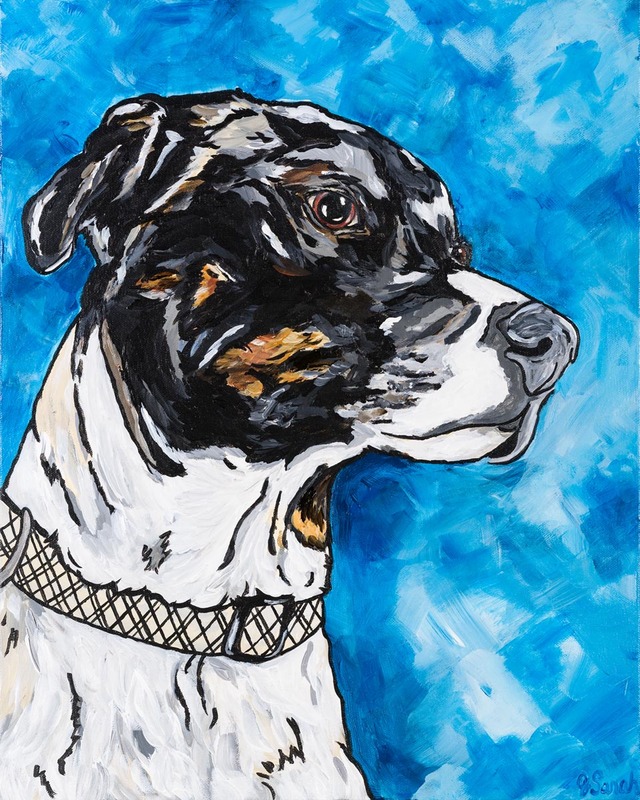 Cooper was the very first dog I painted for this project. 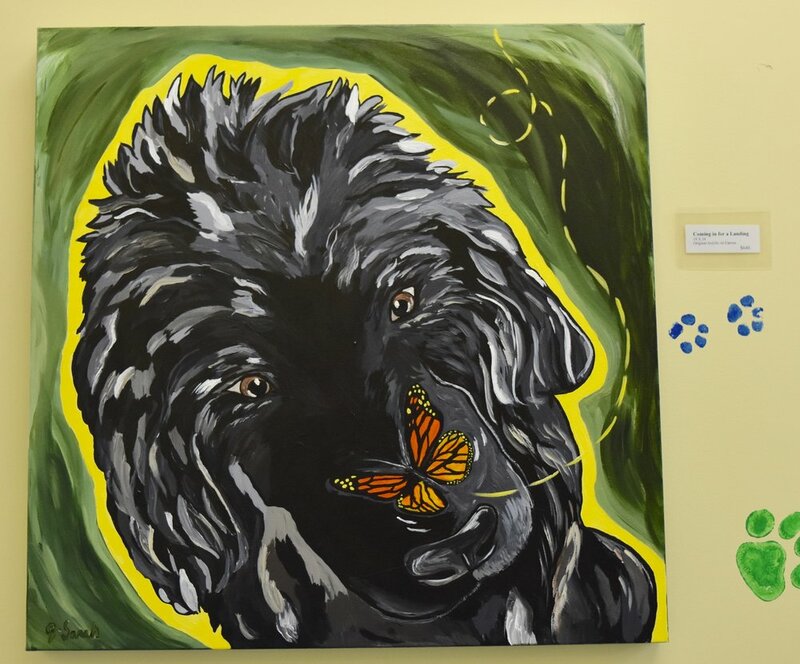 I was pleasantly surprised to see a glimpse of the painting while viewing the video at the Homeward Pet Fur Ball Dinner and Auction..but I was even more inspired by hearing this story, it's beautifully produced. As an artist, I'm deeply connected to my subject matter and do my best to try to live the message of pet adoption and rescue. My hope is to shine a light on how companion animals were truly put here on earth to provide unconditional love and companionship. If you have a few moments, please take a look at his Cooper's incredible journey to find a forever home. His new owner's shares his story in finding Cooper and it's truly heartwarming. "Now That's a Sad-Looking Dog"
This is often the reaction I get from people who view this painting, and they're not wrong. When people view "Loyalty of Hachiko" they are seeing a painting of a dog missing his master, His expression is a sad, thoughtful one and asks if you have seen his owner. 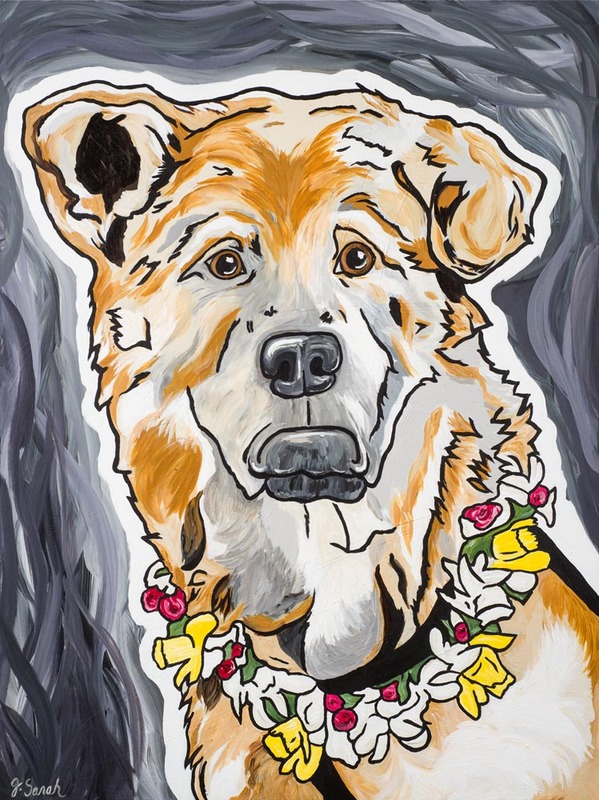 "Loyalty of Hachiko" Original Acrylic 30" X 40"
Hachiko was dog that lived in Japan in the early 1920's and 30's. His story and my reason for painting him follows. 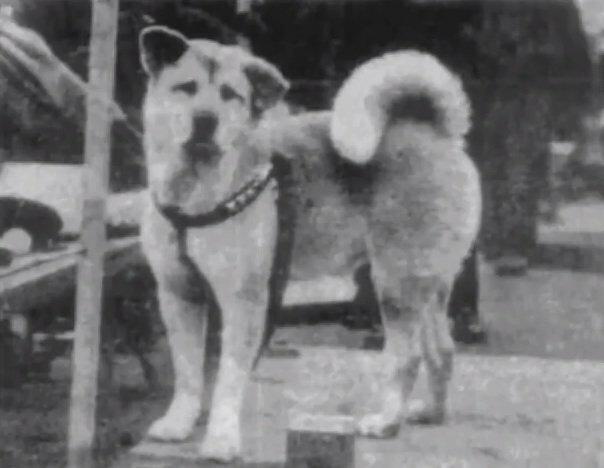 Hachiko, was an Akita dog that belonged to a professor at the University of Tokyo. Every day he would meet his master at Shibuya Station until one day in 1925 when the professor never returned. Unbeknownst to Hachiko, his master had suffered a fatal brain hemorrhage and would never come home again. But there Hachiko sat, day after day, waiting in vain for the return of his beloved master. Other family members of the professor tried to bring him home but he would always return to the train station. He eventually lived out his life as a stray, relying on others who would feed him. The story of the dog that never gave up gained a lot of attention from local and national news, inspiring many people to visit Hachiko at Shibuya Station to offer treats. The story eventually spread throughout the world and a Hollywood film starring Richard Gere was even made based on Hachiko’s story. 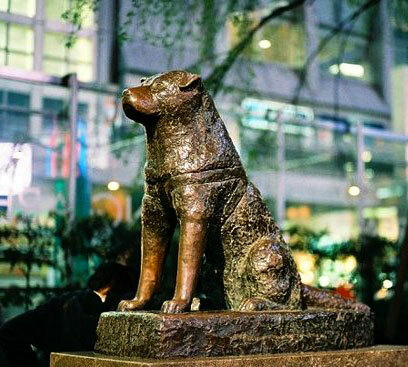 Years later, a statue was erected in Hachiko’s honor and a replica of the original still stands near Shibuya Station. Hachiko’s statue remains a symbol of this dog’s extreme loyalty and a reminder of the lengths one can go to stay devoted to a friend. Hachiko's statue remains a symbol of this dog's extreme loyalty. After reading Hachi’s story and legacy, I was moved to paint this dog from the past that still inspires and shows the sweet and loyal nature of dogs. Because all of the old photos of Hachi are black and white, I included those colors in the painting but also added some of what would have been his natural coloring to bring him into the modern day. A lei is placed around his neck as a symbol of honor. I ordered a lei from a local flower shop, put it on my own dog and photographed it for placement. 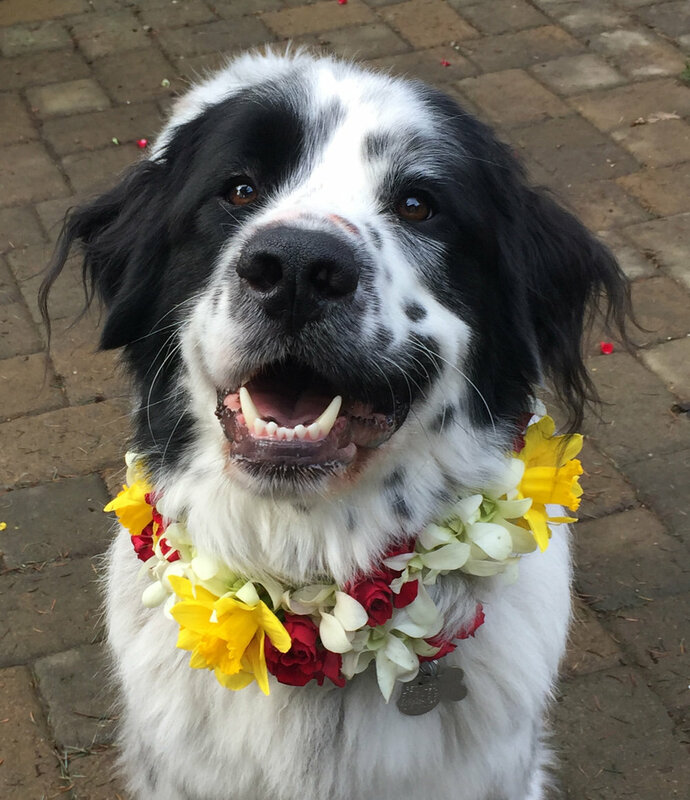 Ranger modeling a lei from a local flower shop so I could know where to paint one on Hachi. I went through several photos and poses. There were many flower petals all over the patio! The legacy of Hachiko highlights the special bond that people can have with companion animals and the unconditional love and comfort they provide. Dogs work to help police officers in K9 units, they sniff out explosives during war, provide guidance to the blind, companionship to the elderly, help those with a disability and assist people in countless other ways. My hope is to paint more of these animals and highlight how they were put here on earth to enhance and enrich our lives. Smoky was found in a foxhole during World War II, she visited injured soldiers and became one of the first therapy dogs. 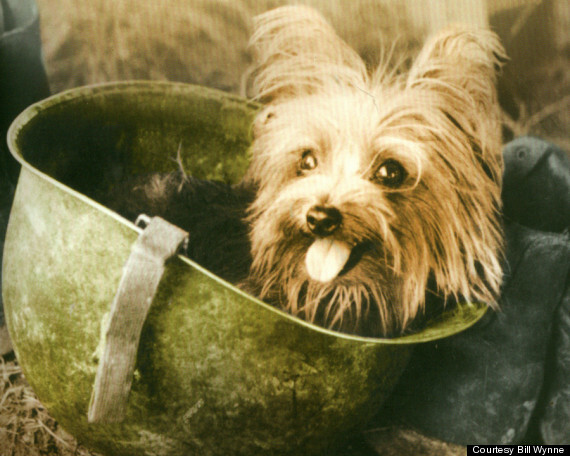 Smoky, the yorkshire terrier that provided comfort to soldiers during World War II is the next dog to be painted in this series. And yet, I know that what they give back in return--unconditional love, loyalty, comfort, playfulness, alerting me that my Amazon package has arrived with a mighty bark...is worth having a patchy backyard. 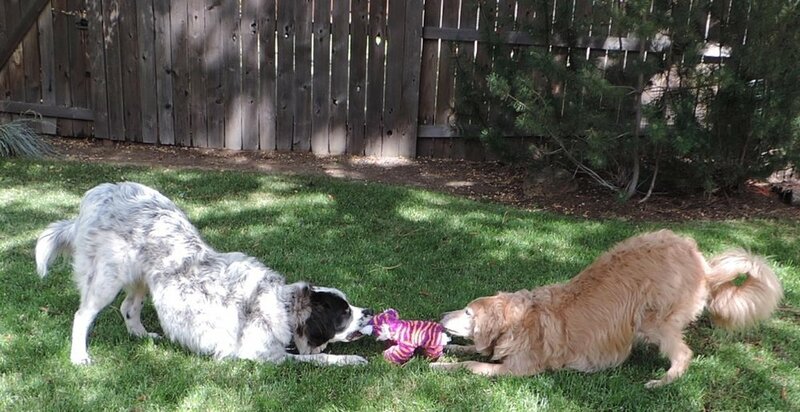 Ranger and Sadie playing a game of tug of war. If your social media feeds are anything like mine they are filled with videos of dogs being saved from terrible living conditions that turn into healthy, loyal family pets, kids giggling at the family Boxer doing zoomies around the living room or a German Shepherd lying at the casket of a deceased soldier. I wish that I could honor all of the pets that have touched people's lives. I try my best to bring out the joy and happiness that they give to us in my artwork. This is why I love having my artwork up at Homeward Pet Adoption Center in Woodinville. It lines the hallway where people go to meet their new family member. Homeward Pet has been helping animals find new homes for over 30,000+ animals for 28 years. As the number of adopted pets got closer to the 30,000th mark, in order to help celebrate, I was asked to paint a portrait of the 30,000th adoption, which happened just a couple of weeks ago! It was a kitty named Spike. I love being able to honor a place that does so much to help animals. 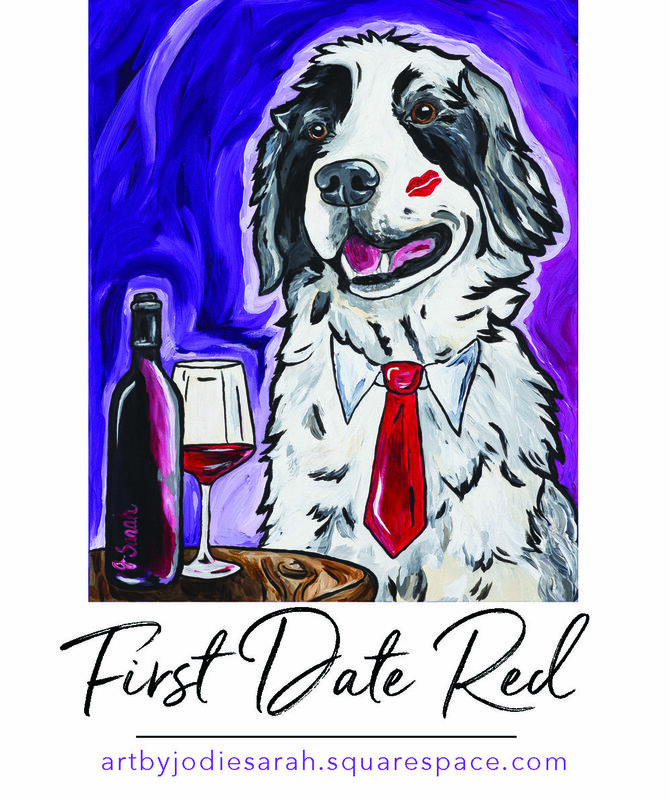 And before I forget, throughout February, Northwest Cellars is donating a dollar per bottle to Homeward Pet with the First Date Red label on it. Also, I will donate 10% back to Homeward for every limited edition print sold at Northwest Cellars throughout February and March. "First Date Red" Labels being put on bottles at a recent event to honor volunteers for Homeward Pet. Lately, I have had the privilege of having some wonderful media attention. In addition to my interview on the KOMO Seattle Refined show, (which you can view on my "About Me" Page if you missed it) I was recently featured as the spotlight artist in Kirkland Living Magazine. It goes to a selective number of homes in Kirkland, but you can read the article here. I think as an artist you have to paint what is near and dear to your heart. What you know well. It's no doubt that I have a soft spot in my heart for animals. I grew up with dogs and cats. So it might be surprising that before my husband and I got our first dog as a family, I had some reservations. We had two cats for almost 20 years and I always believed they were relatively easier to care for than dogs, at least in my opinion. However, our son, who was 10 at the time--had been wanting a dog for quite awhile and I felt he had waited long enough. Even while driving to pick up our new puppy, part of me wanted to turn back--the barking, dog hair, piles of poo in the yard, potty training, exercising them, and the boarding we would have to pay for when going on vacation--it had been over 20 years since I had a dog and just wasn't sure I was ready. As it turns out I was ready. Now, five years later--after that puppy was first placed in my arms--we delight in the TWO doggie outlines that pop up in the window when we pull up in the driveway, one in the shape of a golden retriever mix and the other a Great Pyrenees mix--a rescue from Texas. Yes, it's more work, but they are my forever toddlers and I wouldn't change a thing. They are a large part of my inspiration. This is why I'm so excited to have my artwork at Homeward Pet in Woodinville. It's a place where families are completed with the unconditional love of a pet--just like mine was. Homeward Pet is a no-kill shelter located in Woodinville, Washington. They have generously offered me a very large wall space to hang my artwork. It's the hallway where people go to meet and greet their potential new best friend. It's a lively, active space where the people there are working towards the well-being of the animals. I want my art work to be able to give back in the best possible way, and this is it. I will be donating 20% of my sales for any artwork purchased on the wall at Homeward Pet back to Homeward Pet. Fresh and colorful paintings line the wall at Homeward Pet, a no-kill shelter in Woodinville, Washington. Also, on occasion, I will be featuring a painting of an animal that--due to special circumstances--has been at Homeward the longest. On one of my visits to Homeward Pet, I met Cooper, a Blue-Tick Coonhound. I had never even heard of the breed but he is beautiful and charming. He has been at the shelter for months, but is currently under foster care to heal from his surgeries. He is sure to make someone a wonderful companion once he has healed. 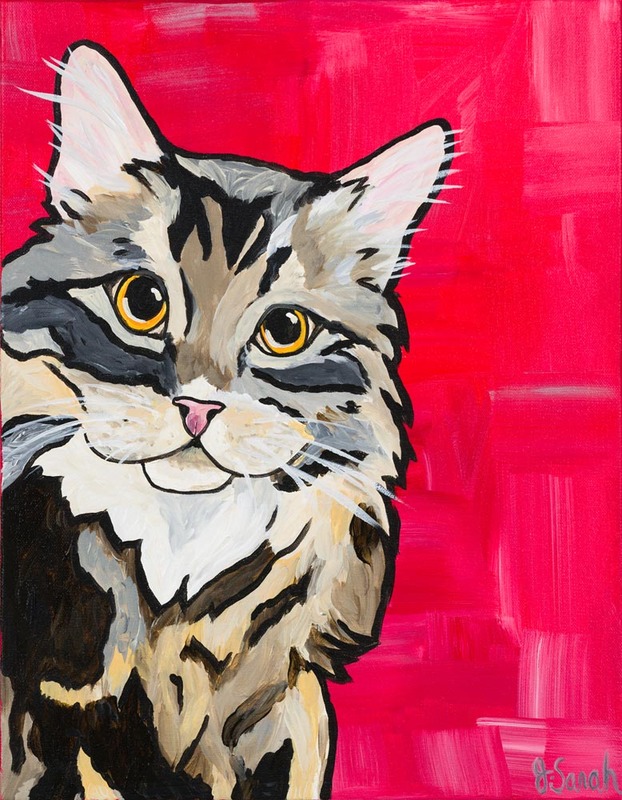 Once he finds his forever home, this painting will be gifted to his adoptive family. Cooper and the painting that will go home with his adopter as a gift. Here are the paintings that are currently hanging at Homeward Pet. "Confetti Maker" 24" X 24" Acrylic/Mixed Media on Canvas, $640.00. I tore up an old dog-training book to create this one. 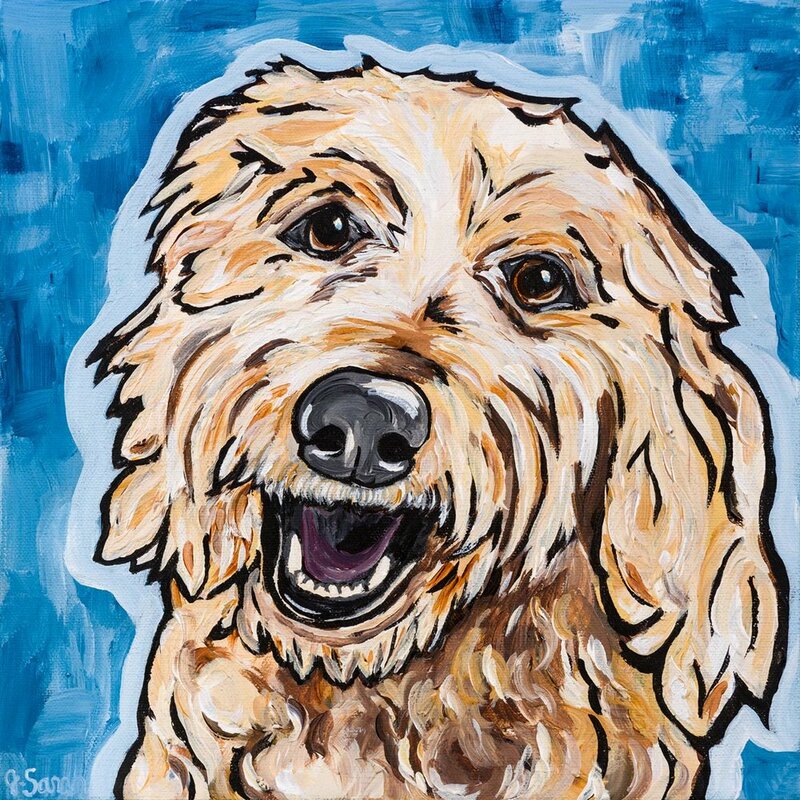 If you're interested in purchasing any of the paintings here, or want to talk about having your own pet painted, contact me at masiwchuk@comcast.net. Now go hug your own dog or cat, but if you don't have one and think you are ready to adopt, I happen to know of a great place you can go. ;) Take care. A couple of years ago, my family and I were discussing options for our upcoming vacation, as I was flipping through our latest issue of National Geographic Traveler magazine, there happened to be a blurb about different kinds of vacations you can take with your family. It mentioned Best Friends Animal Society in Kanab, Utah, where it said you could take a tour, volunteer hands on with the animals and even have doggie sleepovers. I thought, you know, instead of doing the typical vacation, we’re going to this animal sanctuary in southern Utah for spring break. We’re going to try something different. So, we had a great time and rented a house in southern Utah near the sanctuary. We volunteered in Dogtown, we toured the sanctuary, which is amazing and beautiful, we walked dogs, swept a little and gave a couple of dogs a break from the shelter with sleepovers. We have since been to the sanctuary five times to volunteer. If you adore and appreciate animals, it really is that much fun. I have to admit I knew all Pit Bulls, or the term I actually prefer--American Staffordshire Terriers, shouldn’t be judged as most of society always has, but there was always that little part of me that was a bit unsure and afraid of them. All you have to do is listen to the news and the media’s perpetual portrayal of this breed as being...well...not good. 10-year-old Chief lounges with us outside. We volunteered in an area called “Old Friends” - a place in the shelter were older dogs lived in Dogtown. We walked Chief and another dog named Magnolia. Magnolia was a mutt that loved her walks, a senior girl that was resistant to go back into her run. Chief was much more mellow. Charming though she was, Magnolia was a bit of a puller. My husband and I found ourselves arguing over who got to walk the more laid back Chief. We decided to take him on a sleepover for a night that turned into two...which turned into three. It’s not hard to fall in love with a dog over a few hours, parting with him after a getting to know him after a few days was torture. If it weren’t for owning an already dog-reactive retriever, we most certainly would have brought him home permanently. For our sleepover(s), we were set-up with a bag of food, treats (in an adorable little baggie decorated by schoolchildren as part of a school project, no less), a blanket, his favorite tire rope toy, a leash and we were on our way. Chief was a very confident dog. The moment he hopped into the car, he gave my husband a quick lick on the face, then turned to me to give me a smooch. We paused and looked at each other for a moment. It left us a bit stunned but pleasantly suprised. From that moment on, we learned that each dog truly is an individual. During the three days we had him, we would proudly say to each other statements like, “I just got kissed by a Pit Bull.” “Hey, I’m walking a Pit Bull.” “Look, I’m hugging a Pit Bull.” Chief was the best ambassador for his breed. In Chief’s biography at the sanctuary, it said he would make a great hiking buddy, but once we got him home to the rental, all he wanted to do was snooze and snuggle on the couch. While my son works the computer, Chief falls asleep on my son's hand. Trying out a different couch. Which brings me to this next photo, which was actually kind of a mistake. We were having dinner on the patio outside and Chief was such a good dog, it didn't even cross his mind to beg for our food. He just sat quietly with us. After dinner, I got my camera out to take some pictures. I was trying to get a shot with his face looking directly at me, and he just kind of turned away for a moment. I would normally think this is a throwaway photo, but his expression looked kind of proud and I saw something more in it. The proud and dignified Chief. After a couple of sketches based from this photo, I popped a wine glass next to his leg and went ahead and created this watercolor and ink, ”Pinot Noir Pup.” The wine glass added a lightness to the art that I enjoyed. In addition, I loved the idea of taking an underdog breed like a Pit Bull, and elevating it, to a very proud, distinguished, elegant dog that is, well...kind of snooty about his wine. Taking a dog that has such an undeserved bad reputation and giving him a regal presence delighted me. I still think about Chief a lot and wonder how he is doing, I recently learned that he was adopted and found a nice home with his very own couch to sleep on. Since meeting this gentle soul, I now know why people dress their Pit Bulls in pink collars and tutus. Because this is how they are viewed by many of their owners...a dog sweet enough to wear pink. And they’re not wrong, because so many of them are. Hugging the beautiful, charming Chief. And I sooo enjoyed drawing the strip. It really was one of the best times of my life. But now, other than custom comic strips, I've moved on to painting and focusing primarily on creating pet portraits. It's amazing how the ebb and flow of your life can bring you to express yourself in different ways. This is particularly true for the creative person. When I was a young mother, the comic strip provided the perfect outlet for the humor as well as struggles I saw around me. Now that my son is a teenager, my two dogs act as my forever toddlers. It felt natural and right to make the switch over to painting them, and everyone else's dog as well! I like this because painting someone else's pet is more about bringing to light the client's own unique relationship to their pet. My hope for this blog is to focus on not only promoting my own art, but to support other artists and bring to light animal rescue organizations. I hope you enjoy reading it.